↑ Hoskin, J. O.; Kiloh, L. G.; Cawte, J. E. (1969-04-01). "Epilepsy and Guria: the shaking syndromes of New Guinea". Social Science & Medicine. 3 (1): 39–48. doi:10.1016/0037-7856(69)90037-7. ISSN 0037-7856. PMID 5809623. ↑ Scott, Graham (1978). The Fore language of Papua New Guinea. (Pacific Linguistics, Series B No.47). Canberra: Dept. of Linguistics, Research School of Pacific Studies, Australian National University. pp. 2, 6. ↑ Whitfield, Jerome T.; Pako, Wandagi H.; Collinge, John; Alpers, Michael P. (2008-11-27). "Mortuary rites of the South Fore and kuru". Philosophical Transactions of the Royal Society B: Biological Sciences. 363 (1510): 3721–3724. doi:10.1098/rstb.2008.0074. ISSN 0962-8436. PMC 2581657. PMID 18849288. ↑ "When People Ate People, A Strange Disease Emerged". NPR.org (in อังกฤษ). สืบค้นเมื่อ 2018-04-08. ↑ "Kuru: MedlinePlus Medical Encyclopedia". medlineplus.gov. สืบค้นเมื่อ 2016-11-14. ↑ 6.0 6.1 6.2 6.3 6.4 6.5 Alpers, Michael P. (2007). "A history of kuru". Papua and New Guinea Medical Journal. 50 (1–2): 10–19. ISSN 0031-1480. PMID 19354007. ↑ 8.0 8.1 Collinge, John; Whitfield, Jerome; McKintosh, Edward; Beck, John; Mead, Simon; Thomas, Dafydd; Alpers, Michael (2006-06-24). "Kuru in the 21st century—an acquired human prion disease with very long incubation periods". The Lancet (in อังกฤษ). 367 (9528): 2068–2074. doi:10.1016/S0140-6736(06)68930-7. PMID 16798390. ↑ 9.0 9.1 9.2 "A life of determination". Monash University. สืบค้นเมื่อ 20 January 2016. ↑ 10.0 10.1 "Department of Health | The epidemiology of kuru in the period 1987 to 1995". www.health.gov.au. สืบค้นเมื่อ 2016-11-10. ↑ Collinge, John; Whitfield, Jerome; McKintosh, Edward; Frosh, Adam; Mead, Simon; Hill, Andrew F.; Brandner, Sebastian; Thomas, Dafydd; Alpers, Michael P. (2008-11-27). "A clinical study of kuru patients with long incubation periods at the end of the epidemic in Papua New Guinea". Philosophical Transactions of the Royal Society B: Biological Sciences (in อังกฤษ). 363 (1510): 3725–3739. doi:10.1098/rstb.2008.0068. ISSN 0962-8436. PMC 2581654. PMID 18849289. ↑ 12.0 12.1 12.2 12.3 12.4 12.5 12.6 Imran, Muhammad; Mahmood, Saqib (2011-01-01). "An overview of human prion diseases". Virology Journal. 8: 559. doi:10.1186/1743-422X-8-559. ISSN 1743-422X. PMC 3296552. PMID 22196171. ↑ Wadsworth JD; Joiner S; Linehan JM; และคณะ (March 2008). "Kuru prions and sporadic Creutzfeldt–Jakob disease prions have equivalent transmission properties in transgenic and wild-type mice". en:Proc. Natl. Acad. Sci. U.S.A. 105 (10): 3885–90. doi:10.1073/pnas.0800190105. PMC 2268835. PMID 18316717. ↑ Lindenbaum, Shirley (2001-01-01). "Kuru, Prions, and Human Affairs: Thinking About Epidemics". en:Annual Review of Anthropology. 30 (1): 363–385. doi:10.1146/annurev.anthro.30.1.363. ↑ 15.0 15.1 "Kuru: Background, Pathophysiology, Epidemiology". 2016-04-27. ↑ Kupfer, L; Hinrichs, W; Groschup, M.H (2016-11-10). 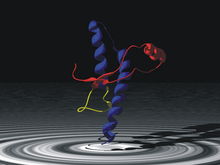 "Prion Protein Misfolding". en:Current Molecular Medicine. 9 (7): 826–835. doi:10.2174/156652409789105543. ISSN 1566-5240. PMC 3330701. PMID 19860662. ↑ Linden, Rafael; Martins, Vilma R.; Prado, Marco A. M.; Cammarota, Martín; Izquierdo, Iván; Brentani, Ricardo R. (2008-04-01). "Physiology of the Prion Protein". Physiological Reviews (in อังกฤษ). 88 (2): 673–728. doi:10.1152/physrev.00007.2007. ISSN 0031-9333. PMID 18391177. ↑ Liberski, P. P. (2009). "Kuru: Its ramifications after fifty years". Experimental Gerontology. doi:10.1016/j.exger.2008.05.010. ↑ "Kuru : Article by Paul A Janson". eMedicine. 2009-04-13. สืบค้นเมื่อ 2010-02-01. ↑ "Releases". Sciencedaily.com. สืบค้นเมื่อ 2016-11-12. ↑ 23.0 23.1 Mead, Simon; Whitfield, Jerome; Poulter, Mark; Shah, Paresh; Uphill, James; Campbell, Tracy; Al-Dujaily, Huda; Hummerich, Holger; Beck, Jon (2009-11-19). "A Novel Protective Prion Protein Variant that Colocalizes with Kuru Exposure". New England Journal of Medicine. 361 (21): 2056–2065. doi:10.1056/NEJMoa0809716. ISSN 0028-4793. PMID 19923577. ↑ "Supply file" (PDF). doi:10.1056/nejmoa0809716/suppl_file/nejm_mead_2056sa1.pdf. ↑ "Natural genetic variation gives complete resistance in prion diseases". Ucl.ac.uk. สืบค้นเมื่อ 2016-11-12. ↑ "Definition of PSYCHOSOMATIC". www.merriam-webster.com. สืบค้นเมื่อ 2016-11-21. ↑ "KURU". www.macalester.edu. สืบค้นเมื่อ 2016-11-21. ↑ "Kuru Among the Foré - The Role of Medical Anthropology in Explaining Aetiology and Epidermiology". arcjohn.wordpress.com (in อังกฤษ). 15 May 2012. สืบค้นเมื่อ 2016-11-21. ↑ 29.0 29.1 Shirley Lindenbaum (14 Apr 2015). "An annotated history of kuru". Medicine Anthropology Theory. ↑ Kotad, K.B. ; และคณะ (2014). "Kuru: A Neurological Disorder" (PDF). 2 (2). International Journal of Current Trends in Pharmaceutical Research: 405–416. ↑ "Horizon - Season 8, Episode 6: Kuru - To Tremble with Fear". ↑ Field, EJ (7 Dec 1967). "The significance of astroglial hypertrophy in Scrapie, Kuru, Multiple Sclerosis and old age together with a note on the possible nature of the scrapie agent". Journal of Neurology. 192 (3): 265–274. doi:10.1007/bf00244170. ↑ Field, EJ (Feb 1978). "Immunological assessment of ageing: emergence of scrapie-like antigens". Age Ageing. 7 (1): 28–39. doi:10.1093/ageing/7.1.28. PMID 416662. ↑ "BSE - mad cow - scrapie, etc. : Stimulated amyloid degeneration and the toxic fats". หน้านี้แก้ไขล่าสุดเมื่อวันที่ 20 กุมภาพันธ์ 2562 เวลา 10:28 น.